Erwin Strittmatter – an important GDR writer – began his career with an apprenticeship as a baker; thereafter, he worked as a chauffeur, waiter, agricultural laborer, and unskilled worker. Because of his brief membership in the Young Socialist Workers [Sozialistischer Arbeiterjugend], he was temporarily imprisoned by the National Socialists in 1934. In April 1941, Strittmatter was drafted into the Order Police [Ordnungspolizei], and in June 1942 his unit was integrated into the newly formed Police Mountain Infantry Regiment 18 [Polizei Gebirgsjäger Regiment 18; renamed SS-Polizei-Gebirgsjäger-Regiment 18 in the summer of 1942]. His group was deployed to Slovenia and Greece to fight anti-Axis partisans in the summers of 1942 and 1943, respectively, and it was also involved in disarming and executing Italian soldiers on the Aegean islands. Dissembling about his wartime activities, Strittmatter joined the SED in 1947 and initially worked as a local official. In 1951, he embarked on a career as a journalist and eventually as a freelance author. 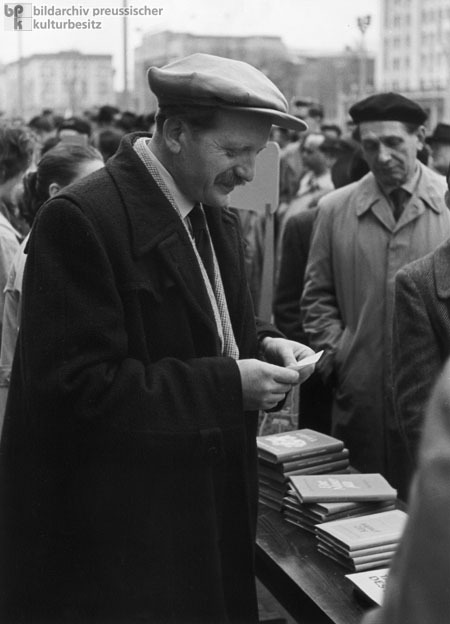 He received the National Prize, Third Class, in 1953 and 1955, and in 1959 he was named the first secretary of the GDR Authors’ Association. Throughout his life, Strittmatter declined to talk about his membership in the Order Police and instead claimed he had deserted as a “soldier” near the end of the war. Photo by Jochen Moll.